The latest communication from James Hansen to his email list this week was a sharp reminder that the New Zealand Government’s commitment to the pursuit of unexploited fossil fuels is part of widespread malpractice. The global stampede to find every possible fossil fuel is not being opposed by governments, no matter how dirty the fuels nor how senseless the energy strategy is from long-term economic and moral perspectives. The specific case that Hansen focuses on is the Alberta tar sands. He has some chilling statistics. Alberta tar sands are estimated to be 240 GtC (gigatons of carbon); see Intergovernmental Panel on Climate Change (2007) Working Group 3 report. That is about seven times greater than the cumulative historical CO2 emissions from oil use by the U.S. (36 GtC). U.S. oil use was 28% of global oil use for the cumulative amounts over the past 200 years. So Alberta tar sands contain about twice the total amount of carbon emitted by global oil use in history. This is the resource that the Canadian government is bent on exploiting for its claimed benefit to the economy. It may be far larger than anything New Zealand’s exploration is likely to reveal, but the same economic justification is offered by the NZ government for its commitment to find and exploit every last bit of fossil fuel that can be tracked down. The same too is the silence about what the burning of the fuel will mean for the global climate. Hansen finds some comfort in a letter sent this week by the Norwegian Grandparent’s Climate Campaign, supported by 27 other organisations, to the partially state-owned Norwegian company Statoil urging it to withdraw its substantial funding for the Alberta tar sands project. Statoil’s heavy involvement in the tar sands project is another example of a government which professes, and to some degree practices, engagement in emissions reduction but in contradiction allows its largely state-owned company to engage in the pursuit of unconventional oil. A letter from a grandparents’ organisation seems unlikely to have much effect and Hansen acknowledges as much. Given the stranglehold that the fossil fuel industry has on governments worldwide and their effective campaigns to misinform the public, this may seem to be a small step. But do not underestimate the potential of people dedicated to a righteous cause to initiate a broader public recognition and understanding of where the public’s interest lies. Righteous cause has an old-fashioned ring to it. I can hear the snorts of realpolitik practitioners. But Hansen is right to see this as a fundamentally ethical issue. It is also not hopeless to advance it on that basis. Not all of society is heedless of morality. I am enclosing a photo from today’s presentation by Norwegian Grandparents Climate Campaign – GCC to Statoil main office in Oslo of letter signed by 28 organizations and political parties demanding that Statoil withdraw from Canadian tar sand. Grandparent Bente Bakke was joined by Anne Dalberg, chair of the Sami Church Council. 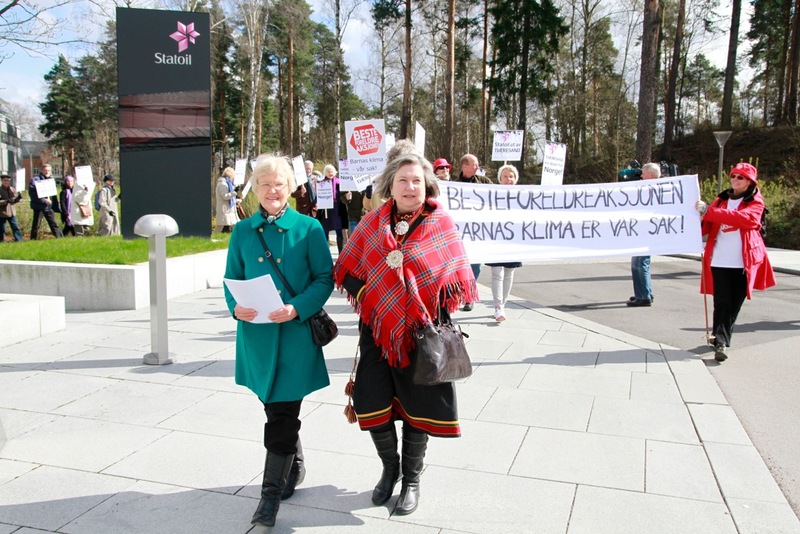 Norway’s First Nation – the Sami – showing solidarity with Canadian First Nations. Money may rule, but morals may be stronger!